Golfers wear gloves for a number of different reasons. One of the main reasons is that a glove will allow the golfer to grip the club better and therefore have more control over the club on their swing. This will help the golfer get more accurate shots than what they may be able to get otherwise. There are also a few other advantages of wearing a glove in addition to controlling the club. For example, a glove will protect your hand so that you are less likely to develop blisters on your hand. It may also help to reduce shock and impact that you feel when the head strikes the ball. There is more than enough to pick from when it comes to getting a high quality golfing glove. Many gloves are made from leather or similar materials so that you get the best possible protection while you are golfing. They also come in different sizes, colors, and styles so that anyone can find a glove that works for them. 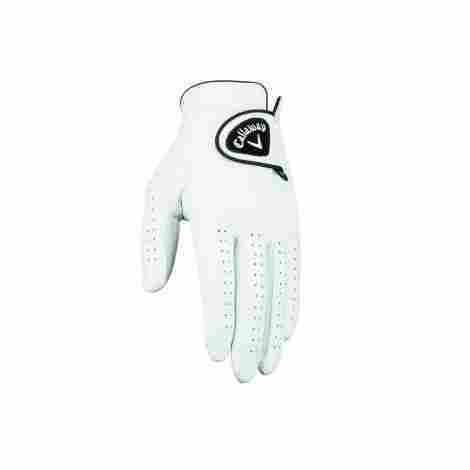 Golf gloves are generally inexpensive as well so they are easy for people to afford them. If you are a person who golfs on a regular basis, then you may want to try owning a golfing glove. Many people turn to Nike when it comes to sporting apparel. The Dura Feel VIII is no exception because it repents the high quality that you have come to expect from Nike. It uses real leather where you need it so that you get the best protection and control over the golf club. Furthermore, you can adjust it to get the right fit. The palm and the thumb of the glove have real leather. This will help you get the best grip on the club and also make the glove itself more durable and long-lasting. The back of the fingers has a stretch fabric on them. This will make sure that the glove fits your fingers properly and that it isn't too loose or too tight. You will be able to purchase the Dura Feel VIII at an average price. This allows you to get a high quality golfing glove without having to pay a premium for it. The palm and the thumb have real leather where it's needed. It has synthetic leather that is perforated for breathability. The fingers and have of the hand have stretch fabric. It's fully adjustable so that you can get the proper fit. You can purchase it in either black or white colors. Users have had issues with it starting to form holes. Other users have had issues with how the glove fits. 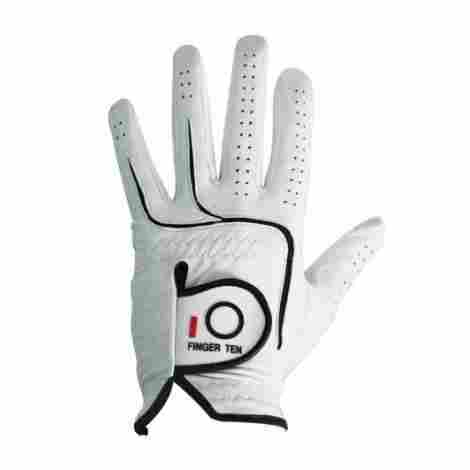 Finger Ten gloves are specifically designed to offer you the best-golfing glove performance that you can get. It's made of a high-quality leather that is durable and long lasting so that you can play all the golf that you want. You will love the grip that you get with this glove so that you can control the club perfectly. It's made of real leather rather than synthetic leather. This will help you get a better grip on the club and offer you more control so that you can play your best. Finger Ten has added spandex in strategic areas of the glove. This will give you lots of flexibility while you are wearing the gloves which will improve your control and comfort. You will be able to purchase this glove at a price that is higher than the average price. The higher price is due to it being made of real leather. The glove is made of real leather instead of synthetic leather. There is spandex placed in strategic areas of the glove. You can purchase it in either a left hand or right-hand version. 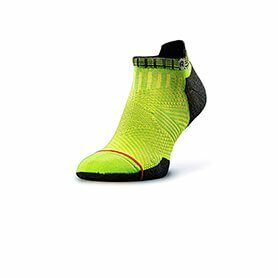 They have an adjustable fit so that you can get them tight. The fingers have perforation so that they vent properly. Users have had issues with them falling apart on them. The Velcro isn't very strong and causes the glove to come loose. Bionic makes a high-quality glove that golfers will love. It has a relief system that pads your hand and keeps you from squeezing the club too hard. This will allow you to have a comfortable swing on each stroke so that you can improve your game and play your best. You will love how comfortable it feels and how well you play. 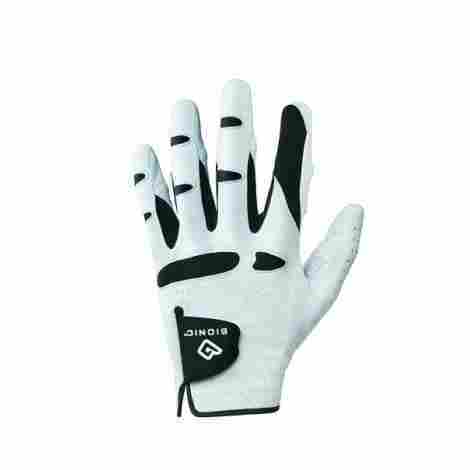 Unlike other golfing gloves, Bionic gloves are machine washable. This makes it easy for you to wash the glove between games of golf so that it stays clean and fresh. The inside of the glove is lined with Terry cloth. This will help to keep your hand from feeling hot and sweaty while you are wearing the glove and improve comfort. This is a premium product so you will need to plan on spending an amount that is higher than the average price because it's made of high-quality materials that cost more. It made from real leather that helps to make it more durable. There is a pad that will keep you from squeezing the club. It has a snug feel that makes it feel like a second skin. The inside of the glove is lined with terry cloth. There is Lycra between the fingers to help them breathe. Some users have reported that it isn't very durable. They are not USGA approved so you may not be able to wear them in tournaments. Golfers will love the feel and grip that comes with a DynaGrip. It's made of Cabretta leather that will offer you grip and protection while you are holding the club. 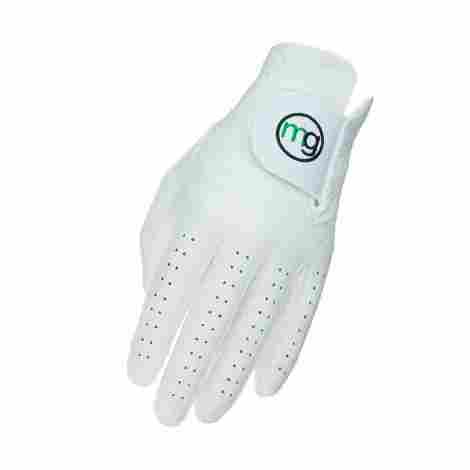 The DynaGrip has won several different PGA events and has been an all-time best seller so you can trust the make and quality of this excellent golfing glove. The fingers are perforated. This will allow the glove to vent warm air as needed so that your hands stay dry and comfortable as you are wearing the glove. It has a Velcro flap in the wrist area that allows you to lock the glove tightly on your hands. This will make for a snug fit and give you good control. You will be able to purchase the DynaGrip at a price that is well below the average price. The low price makes it a bargain buy since you get a great glove without spending a lot. It made completely from Cabretta leather material for grip and durability. All of the fingers are perforated on the back of the glove. This glove is an all-time best seller item. The leather tanning process helps it resist moisture and perspiration. It will help you grip the club without requiring as much pressure. Since it's all leather, it doesn't vent very well. Users have had issues with how the glove fits on their hand. This is an excellent choice for anyone who is looking for a glove that plays well in all weather. It's made of real leather and has ventilation where you need it so that you can feel dry and comfortable even when it's extremely hot outside. The glove has patches sewn on the palm and thumb area to help improve your grip and durability. The area between each of your fingers is vented so that your hands will breathe and stay dry. This will help to improve the comfort of the glove so that you will love wearing it. The palm and thumb areas of the gloves are reinforced with patches. 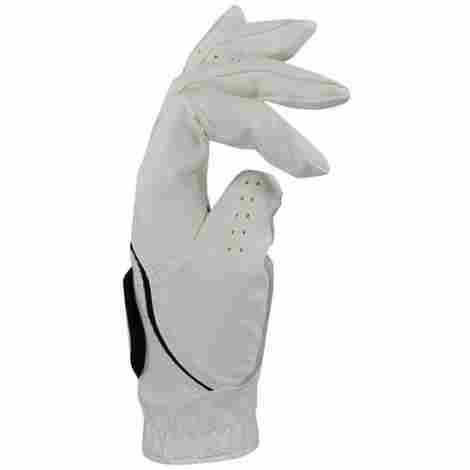 This will improve your grip on the golf club and it also helps the glove to remain durable. Since this is a premium item, you will need to plan on spending an amount that is higher than the average price. The higher price is due to the high-quality construction. The thumb and palm areas are reinforced for extra durability. The area between the fingers is fully ventilated for comfort. The back and the fingers and the thumbs are perforated. It stretches in keys areas of your hands for flexibility. You can use the Velcro flap to get a tight fit. Users have reported that it can be hard to find the right size. They can feel warm on a really hot day. 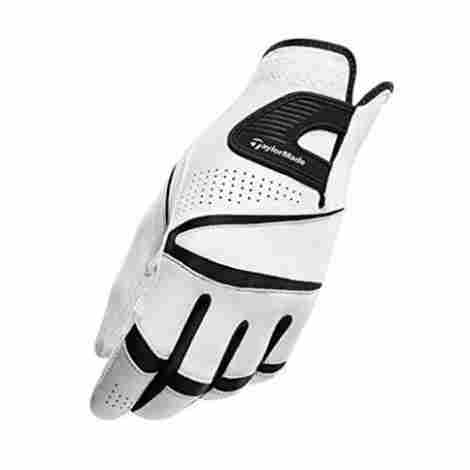 Callaway is well known for making high-quality golf equipment and these gloves live up to the standard that you have come to expect from Callaway. They are made of leather but feature a nice terry cloth interior so that your hands feel dry and comfortable while you are wearing the gloves. Furthermore, they offer you great grip and control over the club. The inside of the glove has terry cloth so that your hands feel nice and dry inside of them. This is a great way to reduce moisture and make the glove comfortable. The gloves are made of a high-quality leather. This will help you get the perfect grip on the club and also all them to be long lasting as well. You will be able to get a pair of these gloves at a price that is lower than the average price. The lower price makes them into a great value since they are all leather. The exterior is made of a high-quality leather material. All of the fingers and the thumbs are perforated for breathability. The inside has terry cloth to help your hands stay dry. You can adjust the cuff to get the perfect fit. You can purchase it in a wide variety of size options. Users have experienced problems finding one that fits right. Other people have seen it develop holes easily when it shouldn't. "The Bird" gets its name from having its logo on the middle finger. While it's up to you how you want to show off the glove, you will love how it feels while you are playing with it. This glove is made of Cabretta leather so that it has a nice soft feel to it while still offering you great grip and durability. The tanning process helps to make the leather water resistant. This will keep your sweat and any rainwater from soaking into the leather and causing the glove to wear out from water damage. The "Nice Shot" logo is on the middle finger, which you can raise up and wave to your golfing buddies every time they have a great shot. It's an interesting way to pay a compliment. 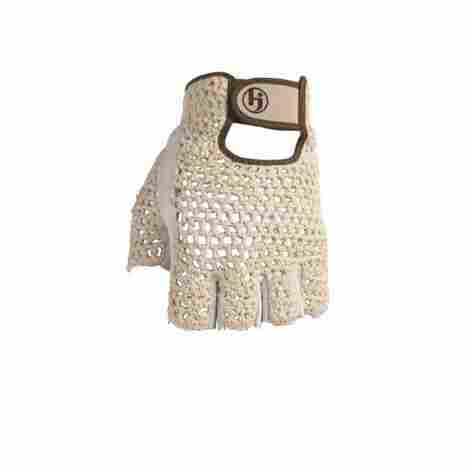 you will find this glove sold at a price that is higher than the average price. The higher price is due to it being made of premium leather that has a natural feel to it. The glove is made of a high-quality Cabretta leather. All of the fingers are perforated to give you ventilation. The tanning process helps it to resist water from moisture and sweat. You can use the logo, located on the middle finger, to congratulate people. The wrist flap will give you an adjustable fit to it. Displaying the middle finger can be offensive to people. Users have reported that the glove develops holes easily. This is a fingerless glove that is crocheted so that you have the maximum amount of breathability. It's a great way to keep your hands dry while you are playing golf in extremely hot weather. The palm features leather for gripping the club and the back has a mesh back that is made of cotton for comfort and breathability so that you feel great. Many golfing gloves are made with leather so that they are durable. The problem is that they don't tend to breathe well which makes your hand feel hot and sweaty. This one has a mesh back that deals with that problem. Rather than having full fingers, this glove has half fingers which help to improve comfort and reduce the amount of fatigue that you will feel while you are wearing the glove. You will be able to purchase this glove at a price that is lower than the average price. The lower price is due to it being made of cotton and it only having half fingers. It has leather on the palm areas for gripping the club. The backside has a cotton mesh that breathes well. The fingers are only half length so that they breathe better. You can adjust the fit with the Velcro tab. It's a great option for when you are in extremely hot weather. It can tear easy if you are not careful with it. It's hard to find the proper size for this glove. TaylorMade is a brand that many golfers rely on to supply high-quality golf equipment. 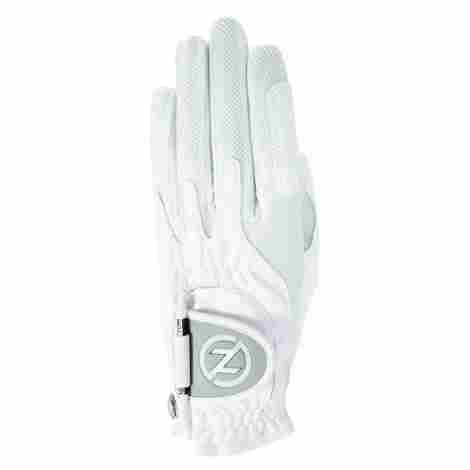 This glove offers you the best in golfing technology so that you can feel comfortable as you play your best game. It's made of leather material so that you can get a nice and firm grip on the club and it will last for many rounds. This glove has stretch lycra material placed throughout it. This will allow you to get the best fit and also helps the glove to flex properly so that you can grip the club. The leather areas of the glove are perforated so that they vent properly and the lycra also gives you ventilation. This will help your hands feel dry and comfortable as you are wearing the glove. You will be able to purchase this glove at a price that is lower than the average price. This turns it into a great buy because you get a high-quality glove without paying a premium for it. It's made with a high-quality leather material that helps it last. There is stretch lycra located throughout the glove for the best fit. The leather areas feature perforation so that it breathes well. You can adjust it to get the proper fit in your hand. It can be purchased in a left hand or right-handed versions. The material starts to stretch after a while and feels loose. The material starts to dry out and develops holes in it. If you are looking for a glove that feels like it's a second skin, then you will love this compression fit glove. It has a lot of mesh areas that breath well but also helps to pull it tightly against your skin. This will help you feel comfortable while you are wearing it since your hands won't get overheated and feel hot and sweaty. The back side features a mesh microfiber that will provide you with the maximum amount of ventilation while you are wearing the glove. It helps keep the glove tight and lets it breathe well. The non-mesh areas are made of a synthetic leather patch that will help you grip the club. This will help to improve your game since you can grip and control the club easier. This brand of a glove is sold at a price that is lower than the average price. You will love how it feels when you get it and it's even better that you didn't have to pay an upcharge for it. It has lots of mesh areas that help it breathe well. There is synthetic patching on the palm for durability and grip. It has a detachable ball marker and golf tee. You can purchase it in different color options to get the right style. The hand has an adjustable flap that lets you get a secure fit. The coating peels off easily and causes it to lose its grip. Other users have had issues with it starting to split. Many golfers love to wear a golfing glove on their non-dominate hand. This helps them control and hold onto the golf club without having to squeeze as hard which helps them play a better game. A good golf glove will also help to protect your hands from the shock that you may experience when the club head strikes the ball which will help reduce injury as well. You are also less likely to develop blisters on your hand when you are wearing a glove. For these reasons, it’s usually a good idea to get a high-quality golf glove. 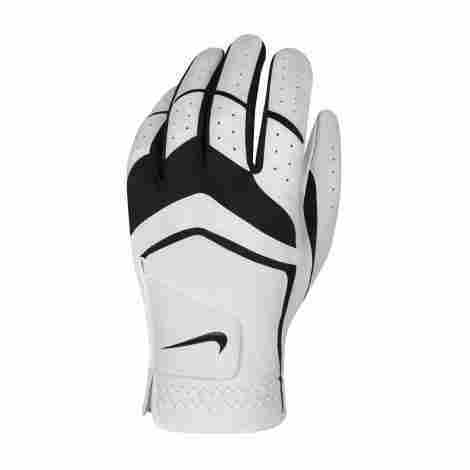 Most people will not have any trouble finding a golf glove that is comfortable and fits with their budget. These gloves are inexpensive and are sold in a wide variety of sizes so that you can get one that fits your hands perfectly. They also come in left and right-hand orientations which means that you can get a glove for either hand. Many golf bags even have a holder for your golf glove so that you won’t lose it when you are not wearing it. A well-made golf glove is considered to be an important piece of equipment that you should have for golfing. When you are looking for a golf glove, you will want to pay attention to the material that is used to make it. There are a number of different materials that are commonly used to make the gloves but some materials are better than others. One of the best materials is Cabretta leather or Brazilian sheepskin. These leathers are smooth and will provide you with the best grip on the golf club. They also flex well and tend to be more durable so that they last longer. The other main material is a synthetic leather. This is a man-made material that is meant to have a feel like leather but is made in a factory and costs less to make. Many inexpensive gloves are made with synthetic leather for this reason. However, synthetic leather has a plastic feel to it and it isn’t able to provide you with as much grip on the golf club. It doesn’t tend to be as durable as real leather either. Many gloves are composed of synthetic and real leather. It’s common for a medium priced glove to be made of synthetic leather and have real leather patches sewn over the palms and on the thumbs. This will help you grip the club naturally but it helps to reduce the cost since the glove is mostly made of lower cost synthetic leather. These gloves last longer than the ones that are made completely out of synthetic leather but they have been known to have issues with the leather patches falling off of the palm and the fingers. For these reasons, your best gloves are made completely out of real leather. You should expect that your golf glove will fit your hand properly. This is important because a proper fit will help you maintain the best control over the golf club. A glove that fits your hand properly will feel as if you are wearing a second skin. There should not be extra material at the ends of the fingers and it should cover your palm properly. You need to check that the glove ends at your wrist and that you can flex your hand naturally as you are wearing the glove. Gloves that are too small can be problematic for a few different reasons. The most obvious reason is that you may not be able to put your hand into the glove in the first place. Even if you can get your hand into the glove, it can be prone to ripping and tearing as you flex your hand and grip the glove. It’s also uncomfortable to wear gloves that do not fit as well. Gloves that are too large will feel loose and make it hard for you to control the club. This is because the club may slip and twist due to the slack in the glove. Just like a glove that’s too small, a glove that is too large isn’t comfortable to wear either. You can also rip or tear a glove that’s too large as the excess material can end up getting caught and pinched. Some gloves have stretch materials in the fingers and have an adjustable wrist tab. These are great features since it will help the gloves fit your hands better. The stretch material on the fingers will help keep the fingers at the proper length and the wrist strap will make sure the glove fits around your wrist properly. The better your glove fits, the happier that you will be with it. Many golfers complain about how their glove does not breathe well. It’s a common complaint due to the fact that golfing gloves are normally made of leather or synthetic leather material. While both materials are durable, they are not breathable and therefore can cause your hands to feel hot and sweaty as you are wearing the gloves. When you are shopping for a good golfing glove, you will want to check and make sure that it has features that will allow your hand to breathe so that you feel more comfortable while you are wearing it. One of the things that you can look for is the perforation. Many golf gloves have perforated fingers and thumbs. This creates vent holes that will allow air to pass through the gloves. More airflow is critical to making sure that heat and moisture can escape so that your hands do not feel hot and sweaty. However, perforation on its own isn’t going to be enough to keep your hands feeling cool. Mesh vents are another feature that is commonly found in higher end gloves. You may also see spandex instead of mesh. The vents are located at the base of the fingers, the back of the palm, and possibly on the back of the fingers as well. This increases the amount of airflow so that your hands can vent and feel cool. Higher end gloves may also have a moisture wicking interior lining inside of the gloves so that your skin doesn’t touch the leather. For example, they may have terry cloth or microfleece inside of the gloves which will help with moisture control. Once again, this will help your hands feel cool and dry. The main reason for wearing a golfing glove is to help you grip the club better. This means that you will want to make sure that the club does not slip while you are using it and it also means that the glove will help you to reduce the amount of pressure that you are putting on the club. Both features will help you play better which is why this is important. You will notice that golf gloves are made from different materials. Each of the materials will affect how the club feels in your hand while you are wearing the glove. Most people agree that Cabretta leather provides the best grip, however, this isn’t the only material used to make golfing gloves. It can be helpful to try on a few different gloves and take some practice swings in order to get a feel for the glove and the club. You are looking for something that gives you the most natural feel. The other thing that you want the glove to do is reduce the amount of pressure that you are putting on the club. Many novice golfers are prone to gripping the club too tightly in their hands which reduces their performance. Some golfing gloves have extra padding in critical areas that will help reduce the amount of pressure that you are putting on the club during your swing. This will lead to you playing a better game of golf which will help to improve your game and satisfaction with the glove. If you are somebody who tends to grip the club too tightly, then you may want to look for gloves that help you reduce the pressure in your grip. The durability of the glove tends to be a complaint that many golfers have when it comes to their gloves. Nobody is satisfied with a golfing glove that only lasts for a few holes before it starts to develop rips or tears. You should always try and find a glove that will last for a long time so that you don’t have to keep replacing your golf glove. If you are an avid golfer, then you are going to need to replace your glove more often than somebody who only golfs occasionally. Nevertheless, a durable golf glove will allow you to play more rounds than one that isn’t as durable. There are a few things that you can consider when you are judging the durability of a glove. One thing is the material, which should be thick enough for the type of material used. Manufacturers can save many and reduce cost by using thin materials. It may be true that a thinner glove will give you more feedback on the club, but it also means that it will wear out faster. You don’t want a glove that is too thin. The next thing to look at is the stitching. It should be tight and there should not be any loose threads either. All of the stitching should be even on both sides of the seam so that there is even support. This will prevent the glove from ripping and tearing at the seams so that it will last longer. Finally, if your glove has a patch on the palm or the thumb, then you should make sure that the stitching is well done so that the patch doesn’t come loose. Q: Why should I wear a golf glove? A: The surface of the glove tends to be tackier than your skin which helps you grip the club better. Wearing a golf glove will also great more friction between the glove and the grip on the club which also helps you have more control. Additionally, gloves can help to reduce blisters that you could get from golfing and they will help your hand feel warmer when you are golfing in cold weather which is additional benefits. Q: How do I wash my glove? A: The way that you wash your glove will depend on the material used to make the glove. As such, you will need to carefully follow the instructions that are on the care tag in order to make sure that you don’t accidentally ruin the glove. Many golf gloves can be washed by hand in water that has mild soap and then hung out to dry. This is the best way to wash the glove if you are not sure. Q: Which hand do I put the glove on? A: If you are right-handed, then you should wear the glove on your left hand. Left-handed golfers tend to wear the glove on the right hand. This way the glove is worn on the hand that is positioned at the top of the grip on the club. There are some golfers that wear the glove on both of their hands as well however most golfers only tend to wear gloves on one of their hands. Q: Should I buy a package of gloves? A: There are a lot of golf gloves that are sold in a package of gloves. For example, some brands of gloves are sold in a three pack rather than individually. This is because it’s usually a good idea to have a spare glove with you while you are on the course. Otherwise, you may have to go without a glove in the event that your glove develops a rip or a tear in it. Q: What is Cabretta Leather? A: This is a leather that comes from hairy sheep. It’s commonly used in golfing gloves because it’s thin and flexible. Additionally, this kind of leather is known to grip the golf clubs well which is another reason why it’s used for golfing. You should try and look for gloves that are made with this leather so that you get the best grip and control over the golf club. It also tends to last longer than other materials.